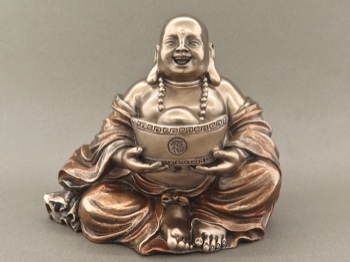 A wonderful, cheerfully smiling Laughing Buddha in resplendent bronze robes. 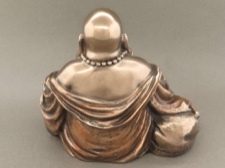 This buddha is plated in a bronze powder resin that emits the gloss and luster of bronze, then is lightly handpainted to add the touches of subtle color. 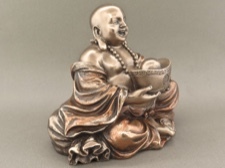 For good luck in all matters including good fortune and great abundance, it is wise to choose a Laughing Buddha that he is holding a bowl. 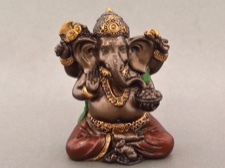 The bowl symbolizes receiving good fortune, or at least being open and ready to receive all good things. 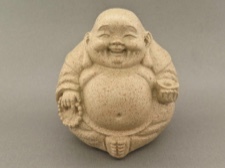 This Happy Buddha is 3 inches tall on a base of 3.5 x 2.5 inches.